A prototype of Hewlett-Packard’s futuristic Machine computer will be ready for partners to develop software on by next year, though the finished product is still half a decade away. 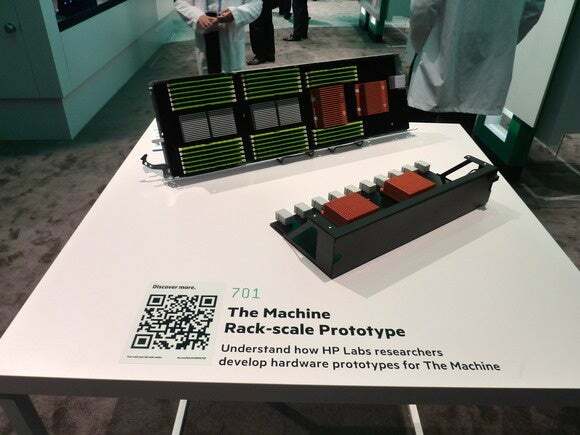 The single-rack prototype will have 2,500 CPU cores and an impressive 320TB of main memory, CTO and HP Labs Director Martin Fink told reporters at the HP Discover conference Wednesday. This is more than 20 times the amount of any server on the market today, he claimed. But there’s a catch: the prototype will use current DRAM memory chips, because the advanced memristor technology that HP eventually plans to use is still under development—one of the big reasons The Machine remains several years away. HP is placing a huge bet that it can develop a new type of computer that stores all data in vast pools of non-volatile memory. HP says the Machine will be superior to any computer today. A system the size of a refrigerator will be able to do the work of a whole data center, it claims. Rivals have scoffed, pointing to the massive task of rewriting software for a new architecture. But HP thinks it’s the only way to deal with tomorrow’s vast data sets in an energy efficient way. 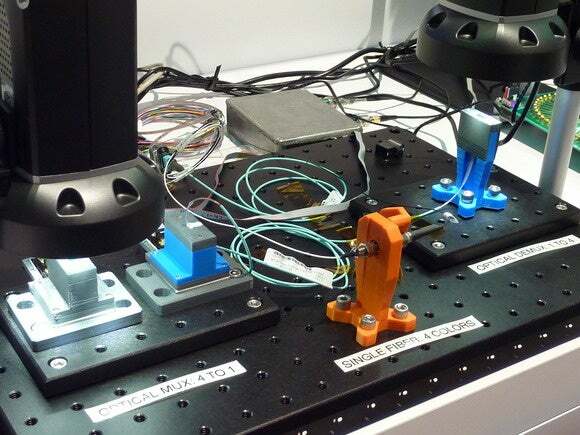 Silicon photonics components for The Machine on show at the HP Laps booth at HP Discover on June 3, 2015. In current server architectures, the CPUs lie at the center, with multiple layers of memory and storage attached, including DRAM and hard disk drives. HP’s goal is to do away with disk drives altogether, and replace DRAM with pools of non-volatile memory. That type of memory keeps its data when the power is switched off, so the Machine can be highly energy efficient. Non-volatile memory exists today, for example NAND Flash, but its performance is slow, at least in high-performance computing terms, and memristors should offer far greater storage density. Next year’s prototype machine won’t be very energy efficient, however. HP will have to keep all that DRAM powered up so that the data will be available to applications. But it will act as a “proxy” for non-volatile memory, Fink said, allowing partners like SAP to start testing applications. He sees a later version of the Machine using phase-change memory, which is another type of nonvolatile memory still under development, and memristors arriving after that. The Machine makes memory “a first class citizen,” he said, with memory pools linked by high-speed silicon photonics that will carry data at 1.2TB per second. “The Machine is driven by making memory the center of the universe, with the processors surrounding it,” he said. And he has a new name for the architecture the Machine is based on: Memory Driven Computing. What apps will The Machine run? HP is having a “huge debate” about the applications that will run on the machine. Most people want to transfer over existing workloads, which HP says will be possible, but more interesting are the new applications not possible today. Fink offered the example of a plane that lands at an airport 30 minutes early but can’t make use of a nearby empty gate, because the airline’s computer systems aren’t smart enough to know it’s available. The Machine will let airlines store all the details about every arrival and departure time, along with gate information, weather data and all the other variables, all in-memory and available for immediate processing. It’s a great story, but as with any major new technology that’s still five years out, it’s impossible to say if it will pan out. Intel once thought it would take over the world with a new processor architecture called Itanium, and that chip seems headed for the scrap heap. But HP is pushing full steam ahead. A Labs booth on the HP Discover show floor has been given over to showcasing technologies that will go inside the new system, including the silicon photonics components. One booth shows an emulation tool HP engineers are using to develop the Machine’s OS and firmware. On a laptop, it can simulate the huge memory pools the system will use even though the hardware itself doesn’t exist yet. Known as the Machine Architecture Simulator, it can also simulate compute nodes for the Machine, and engineers can select from x86 or ARM-type processors, indicating The Machine will be processor agnostic. In fact, the type of processor isn’t important, Fink said. Large companies could even design their own, application-specific CPUs, or attach GPUs or network interface cards. One booth shows a mock-up of what part of the Machine will look like—but it’s a non-working model, a reminder of the work HP still has to do.